Not a NPoCP post, more a which one is most appealing post. So. Checked out that Wagovan today. Not exactly worth spending my money on, though I'm sure someone will enjoy it. I decided to take a look at autotrader, 50 mile radius, under $10k, sedan or wagon. Of those, I've narrowed it down to the following possibles. 2001 325is wagon.... Automatic. 93k miles. 2007 Volvo S60 2.5t. 94k miles. 2003 Infiniti M45. 80k miles. 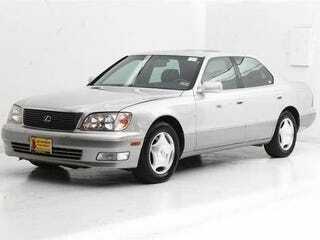 2000 Lexus LS400. 100k miles. There were a few other interesting options that I ruled out for one reason or another. I'd prefer not to sell the MR2, so I'm looking for cars I don't need to make payments on. Something interesting. Doesn't even have to be super fun. Just interesting, and more useful than the 2. I haven't driven any of them yet, but I'm starting tomorrow. Thoughts, Oppo? Tell me what you think and I'll tell you which one I think is my #1 at this point. Sorry about the formatting. Multiple photos on mobile.